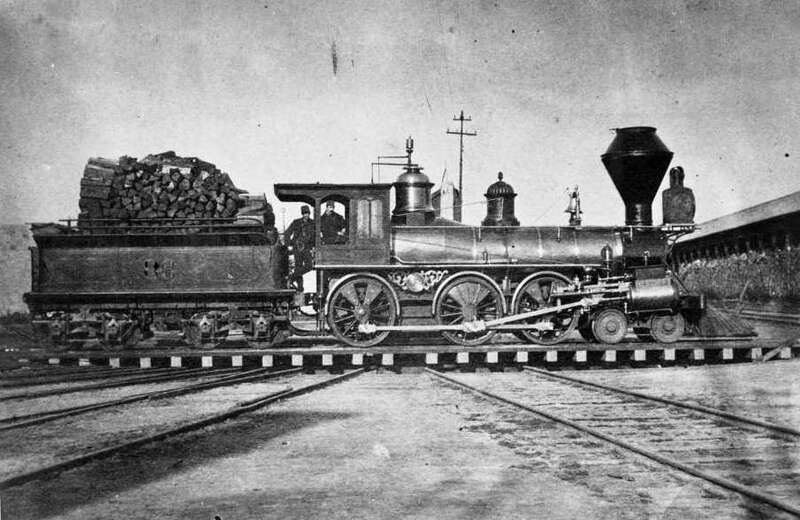 Central Pacific Chief Engineer Theodore Judah already had surveyed the railroad’s route through the Sierra Nevada in May 1863, and just five months later the busy railroad spiked the first rail. Relying on equipment from the eastern United States, Central Pacific’s supply line stretched around the tip of Cape Horn, often taking seven months to reach San Francisco. Just 30 miles from Sacramento, Central Pacific created the first of many massive cuts — Bloomer Cut is 800 feet long and 63 feet deep! Steep winter snows and thick granite plagued the railroad, which often counted progress in inches or feet rather than miles. Central Pacific constructed 15 tunnels through the Sierras; the longest, at Donner Summit, stretched 1,659 feet through pure granite. By spring 1869, Central Pacific had made it through the mountains and onto the relatively flat land of western Utah, constructing 690 miles of track through some of the most difficult terrain ever encountered by a railroad. In 1856, Theodore Judah, who would become Central Pacific Railroad's chief engineer, already had completed the Sacramento Valley Line, running from that city to Folsom, California. It was the first railroad west of the Missouri River — an impressive achievement — but Judah already was thinking on a grander scale: a transcontinental railroad. Shops at Sacramento, California, in 1872. 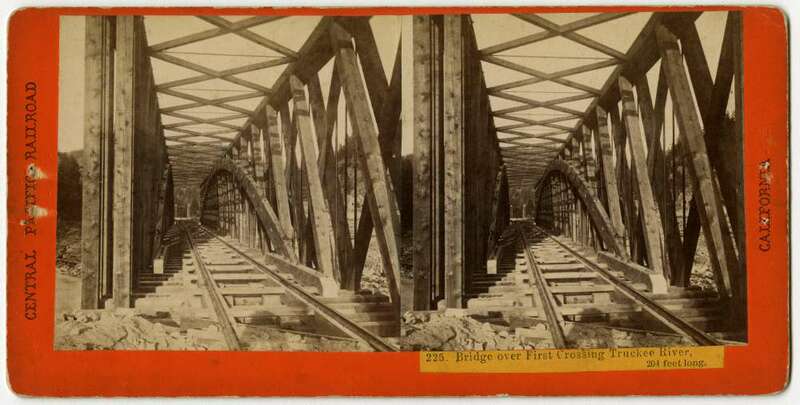 California Pacific Railroad swing bridge across the Sacramento River in Sacramento, California, circa 1868. Passenger cars in foreground. 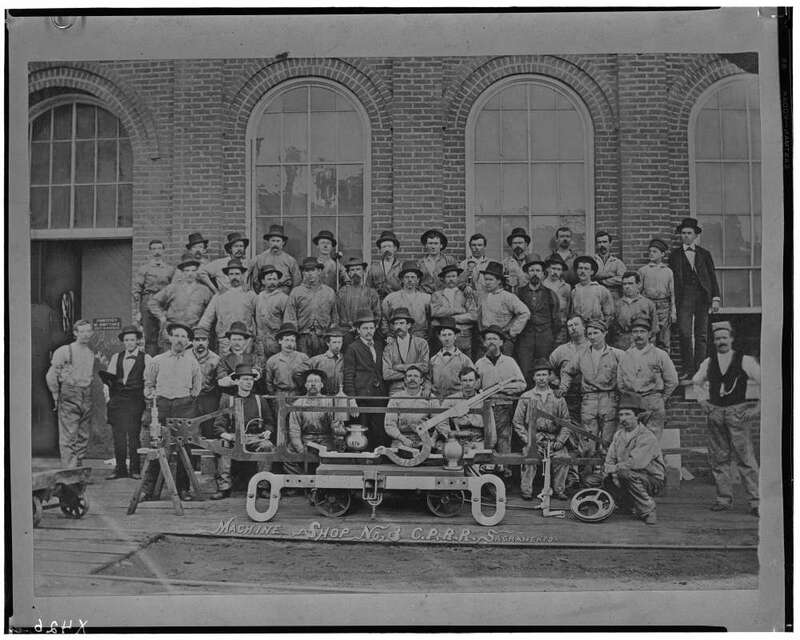 Group of Union Pacific employees pose behind driving rods at locomotive shop in Sacramento, California, circa 1910. A.J. Russell's 19th century photographic images, contained in stereo card format, showing machine shops in Sacramento, California, 1869. Plate 569. After consulting with Dutch Flat storekeeper Doc Strong, Judah drew up a route through the Sierra Nevada range over Donner Summit. In 1861, he obtained financial backing from local businessmen Collis Huntington, Charles Crocker, Leland Stanford, James Bailey and Mark Hopkins. Along with this list of backers, Judah took his Sierra Route chart to Washington, D.C. In 1862, as the Civil War raged on, Judah's vision was finally realized when President Abraham Lincoln signed the Pacific Railroad Act authorizing construction of a transcontinental railroad. On Jan. 8, 1863, ground was broken in Sacramento for the eastbound sections of track. Nine months later, on Oct. 26, 1863, the first spike was driven. As Central Pacific laid tracks eastward, Union Pacific was working westward and the race to Promontory Summit, Utah, where they would eventually meet on May 10, 1869, was on. Judah did not live to see this momentous event. He died in November 1863 after contracting typhoid fever while crossing Panama. Sacramento — whose name is Spanish for "holy sacrament" — continues to be an economic and cultural engine for California's Central Valley, and is the state’s seventh-largest city as well as its capital since 1854. Sacramento's deep-water port is accessed by a 43-mile-long channel from San Francisco, making it a hub for transportation and industry. The Central Pacific and the California Central railroads played a significant role in Roseville's development. When the railroads intersected Jan. 29, 1864, the area where they met was designated "Junction" on railroad maps. 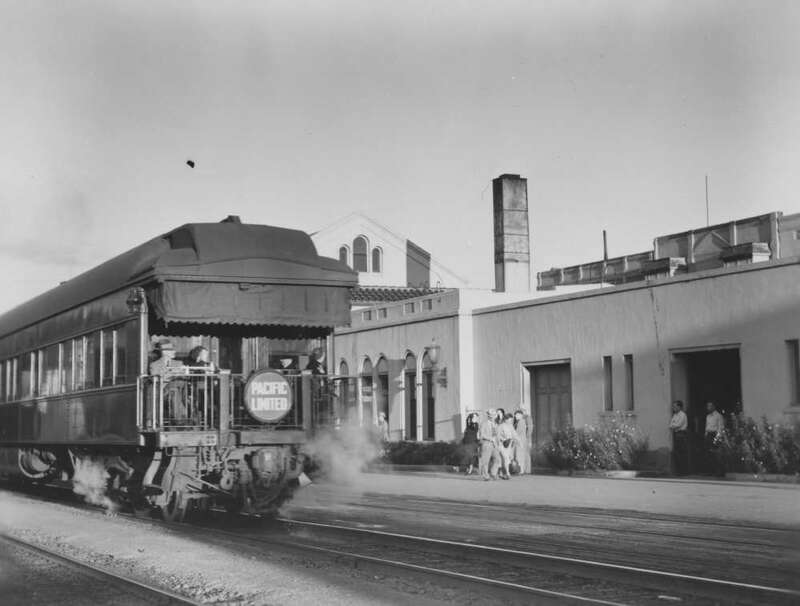 Daily passenger service began on April 26, 1864, from Sacramento to "Junction." The area's name was later changed to Roseville because, according to a popular story, there was an abundance of wild roses growing nearby. The first time a newspaper mentioned "Roseville" was during the 1864 presidential race between Abraham Lincoln and Gen. George McClellan. A stereo card, plate number 134, taken by Alfred A. Hart in California circa 1864. Seventeen miles from Sacramento, a locomotive travels over Dry Creek Bridge, south of Roseville, California. Part of the "Scenes in the Sierra Nevada Mountains" stereo card album collection. Roseville's first building was an unpainted shed used as a depot and freight shipping station by Cyrus W. Taylor, who often was referred to in historical documents as Roseville’s first resident. Soon after the freight depot was set up, another resident, Daniel Van Treese, purchased lots in the area and built Roseville’s first hotel. The railroad always has been one of the area's most important economic development engines, spurring trade, supporting the growth of the agriculture industry and ancillary businesses, increasing residential development and serving as a major employer with a peak of about 6,000 employees in the 1940s and 1950s. In 1996, Union Pacific acquired Southern Pacific Railroad (which by then had absorbed Central Pacific and California Central), and began a $145 million expansion program in Roseville. It marked the return of Roseville as a major West Coast rail center, and perhaps the most important railroad center west of the Mississippi River. The entrance to downtown Roseville today is marked by Southern Pacific steam locomotive No. 2252, an homage to Roseville's railroad heritage. The revitalized Historic Old Town and Downtown Roseville include a rail yard viewing platform. The transcontinental route reached what would become the town of Rocklin on June 6, 1864. A roundhouse was built there to service the larger engines needed to power trains over the Sierra Range. Central Pacific Locomotive No. 86, "Gorilla," at Rocklin roundhouse in 1869. A stereo card, plate number 140, taken by Alfred A. Hart in Rocklin, California, circa 1865. A locomotive sits on the tracks next to the Rocklin Granite Quarry, located 23 miles from Sacramento. Men are examining the rocks. Part of the "Scenes in the Sierra Nevada Mountains" stereo card album collection. A stereo card, plate number 232, taken by Alfred A. Hart in California circa March of 1864. 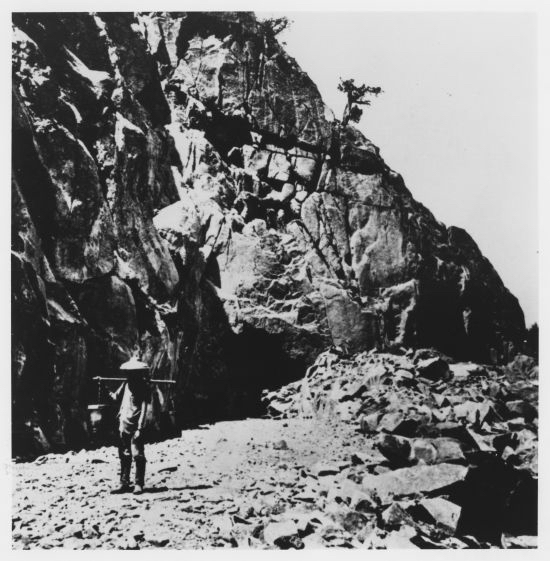 Men utilize cables to move granite at the Capitol Granite Quarry at Rocklin, located twenty-two miles from Sacramento. Part of the "Scenes in the Sierra Nevada Mountains" stereo card album collection. A stereo card, plate number 240, taken by Alfred A. Hart in California circa May of 1864. A man stands between boxcars are at the station in Rocklin, which is located twenty-two miles from Sacramento. Part of the "Scenes in the Sierra Nevada Mountains" stereo card album collection. A stereo card, plate number 241, taken by Alfred A. Hart in California circa May of 1868. Part of the "Scenes in the Sierra Nevada Mountains" stereo card album collection. Locomotive no. 45, "Majestic," sits on the turntables at the station in Rocklin, which is located twenty-two miles from Sacramento. Rocklin became an important point in the building of the railroad. The area was rich in granite, a material the railroad needed for construction. Rocklin, in turn, needed the railroad to transport granite produced in its quarries. In fact, Central Pacific's first paying freight was Rocklin granite. 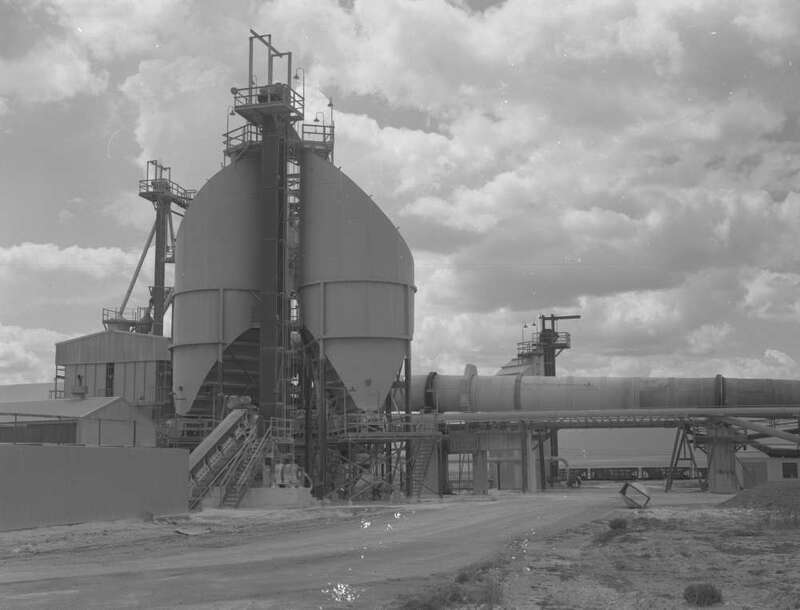 In 1865, Capitol Quarry, destined to become Rocklin's largest, was established to furnish granite for construction of the California state capitol in nearby Sacramento. Thereafter, Rocklin granite was used for public buildings throughout the West. An extensive rail network, consisting of miles of spur track, was developed to serve the largest of the city's 61 granite mining sites. In its prime, Rocklin was known as the Granite Capital of the West, and the extensive quarries most likely contributed to the naming of the town. "Lin" is the common Celtic generic term for "spring" or "pool" as well as for "ravine" or "precipice." Central Pacific Railroad began operating freight and passenger trains over the first 31 miles of track to Newcastle in June 1864. 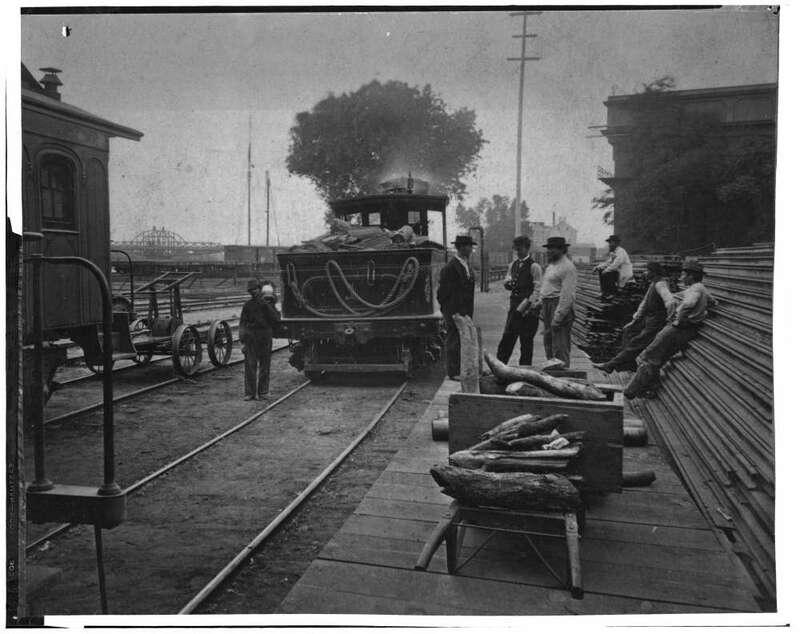 The line began in Sacramento, the railroad's western terminus. But as the railroad continued through the foothills of the Sierras, construction became more difficult. The "Newcastle Gap" required a bridge spanning about 1,000 feet long and 60 feet high. Another bridge of similar size was located a few miles away. 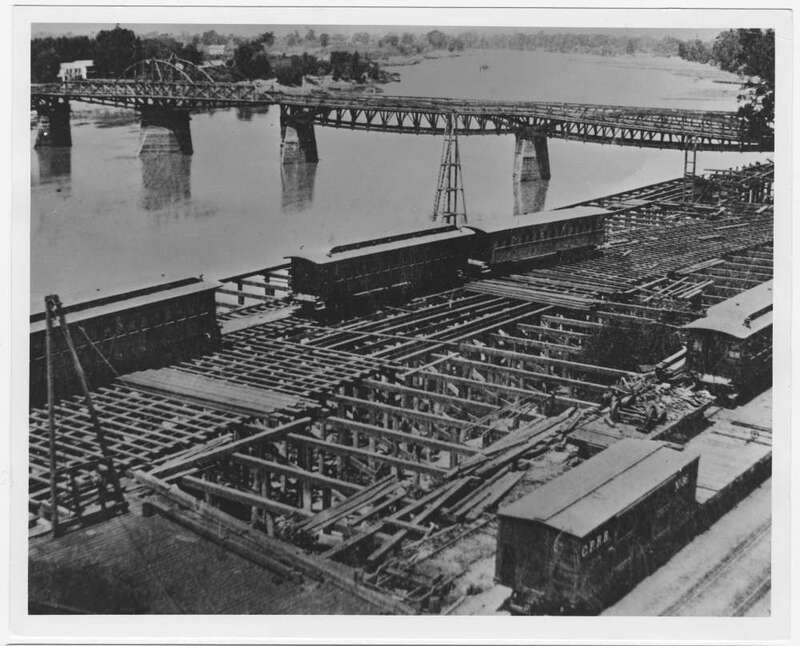 It took some 350 men with 30 carts and 35 wagons to complete the embankment near the bridge, known as the "big fill." A stereo card, plate number 138, taken by Alfred A. Hart in Newcastle, California, circa 1865. A boxcar and passenger car sit on the tracks next to the freight depot at Newcastle, in Placer County. Part of the "Scenes in the Sierra Nevada Mountains" stereo card album collection. A stereo card, plate number 142, taken by Alfred A. Hart in California, circa 1865. A locomotive and rolling stock travel along the tracks at Antelope Ridge, which is located 30 miles from Sacramento, near Newcastle. Part of the "Scenes in the Sierra Nevada Mountains" stereo card album collection. The arrival of the railroad transformed Newcastle. Although the town was located in the heart of gold country, Newcastle became known more for its abundant and varied orchards. The Newcastle Fruit Growers Shipping and Preserving Association was created in the late 1870s, lending the town the title of Placer County's largest fruit shipping center. Commerce and business quickly sprung up after the railroad's arrival. The post office opened in 1864, followed soon after by a grocery store and boot maker. With its 1,000-foot elevation and breathtaking view across the Sacramento Valley, Newcastle quickly became known as the "gem of the foothills." Central Pacific also began construction during the Civil War when labor was scarce. Tens of thousands of young Chinese men had come to California for gold and Central Pacific President J. Crocker suggested that the railroad hire these available workers. Central Pacific Superintendent Strobridge resisted. The Chinese workers were so small, he didn’t believe they could handle the hard labor. He agreed to hire 50 for a month as a trial. The experiment was an enormous success, and by 1865 several thousand Chinese worked on Central Pacific. The Chinese workers' perilous labor played a critical role transforming the country and the communities along the transcontinental route. Learn more about their influence and accomplishments in a number of profiles to follow. Work on the Secret Town trestle, 1877, photograph by Carleton Watkins. Chinese tea carrier, East Portal, Tunnel No. 8, photograph by Alfred Hart. Chinese Camp at Browns Station, 227 miles from Sacramento, photograph by Alfred Hart. Auburn got its name in 1849 by miners from Auburn, New York, who journeyed to the area prospecting for gold. When the gold eventually gave out, Auburn appeared to be headed to a rapid decline. But a decline was avoided when the Central Pacific Railroad reached Auburn on May 13, 1865. Its arrival created a whole new section of the community. Due to the area's geography, the railroad was placed about a mile east of the major settlement at the time, Wood's Dry Digging. The city expanded eastward and began to merge with the older part of town and a new railroad depot. A stereo card, plate number 231, taken by Alfred A. Hart in California, circa June 1865. A train, with men standing on the cars, moves through Bloomer Cut near Auburn, California. The cut is 800 feet long and 63 feet high. By May 1, 1865, just after the completion of the enormous Bloomer Cut, the Sacramento Union newspaper reported that the Central Pacific employed 2,000 men, 1,320 of which were Chinese, but payroll records from the time indicate that the total Chinese employment for March through May 1865 was 3,306. Labor contractor Hung Wah had the largest labor gang, with 388 men in April. 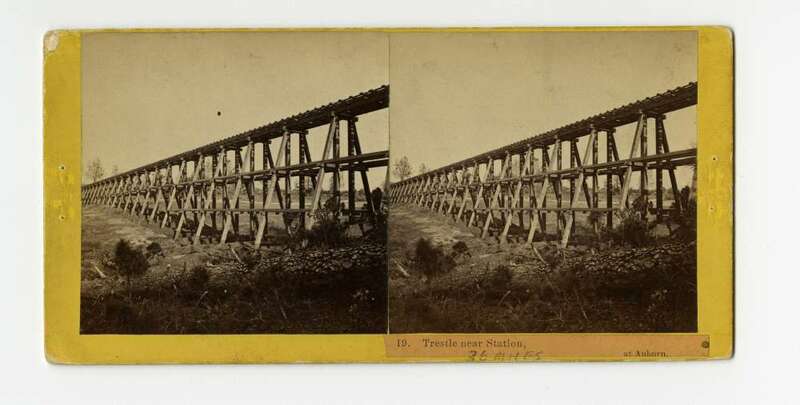 A stereo card, plate number 19, taken by Alfred A. Hart in California, of the trestle near the station at Auburn. 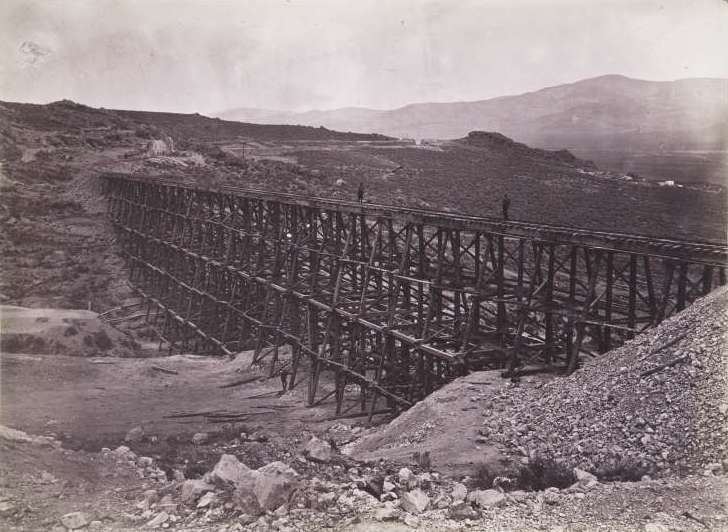 The trestle, photographed circa 1865, is located 36 miles from Sacramento. Part of the Scenes in the Sierra Nevada Mountains stereo card album collection. 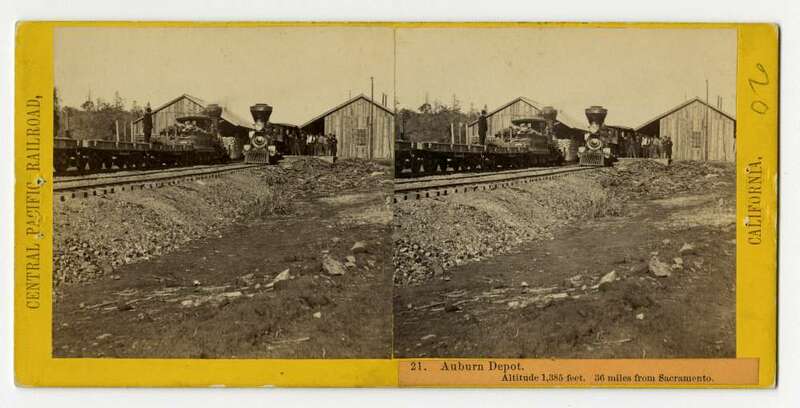 A stereo card, plate number 21, taken by Alfred A. Hart, of the Auburn Depot in California. Photographed in 1865, the depot is located 36 miles from Sacramento. There are two sets of tracks, and a locomotive on each one. 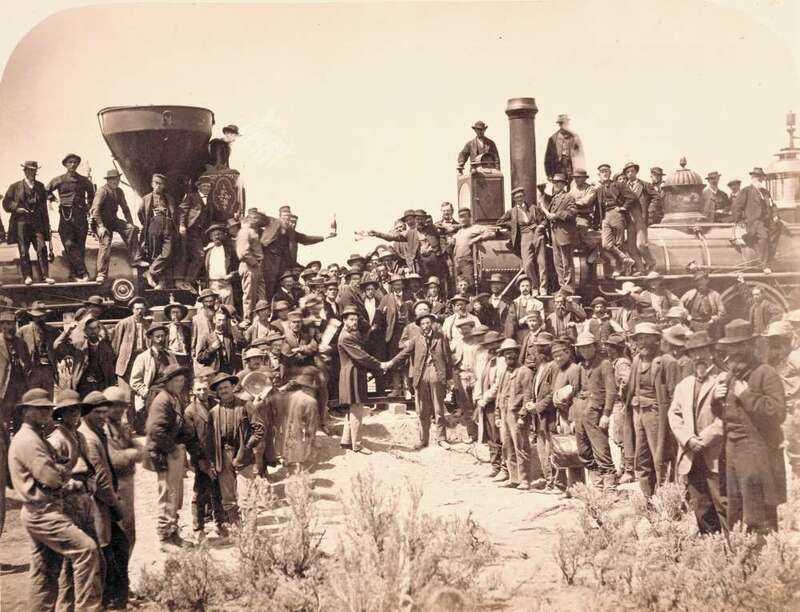 One man is standing on the flatcar on the left, and a group of men are standing next to the locomotive on the right. Part of the Scenes in the Sierra Nevada Mountains stereo card album collection. A stereo card, plate number 24, taken by Alfred A. Hart in Placer County, California. 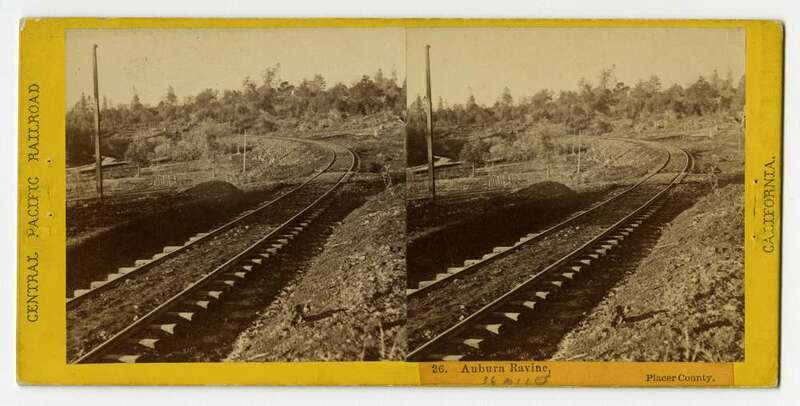 Photographed circa 1865, the image shows the tracks through Lime Point above Auburn. This section of the railroad is located 37 miles from Sacramento. Part of the Scenes in the Sierra Nevada Mountains stereo card album collection. A stereo card, plate number 25, taken by Alfred A. Hart in Placer County, California. Photographed circa 1865, the image shows the tracks along a high embankment in Auburn Ravine. Part of the Scenes in the Sierra Nevada Mountains stereo card album collection. A stereo card, plate number 26, taken by Alfred A. Heart in Placer County, California. Photographed circa 1865, the image shows the tracks through Auburn Ravine. Part of the Scenes in the Sierra Nevada Mountains stereo card album collection. Over a two-year period beginning in 1909, the Southern Pacific — which had merged Central Pacific into its system in 1870 — double-tracked the area in Auburn, creating an eastbound line and a westbound line. A major trestle was constructed, which now passes over Interstate 80 and has become one of Auburn's most recognizable symbols. Before it became Colfax, this important railroad town was first called Alder Grove and then later Illinoistown by a group of miners from Illinois. That would change with Central Pacific Railroad’s arrival Sept. 1, 1865. The speaker of the house at the time, Schuyler Colfax, was sent by President Abraham Lincoln to check the progress of the tracks. So charmed were the citizens by his good cheer and oratory skills that they decided to name the settlement after him. The town remained the terminus of the line for more than a year. 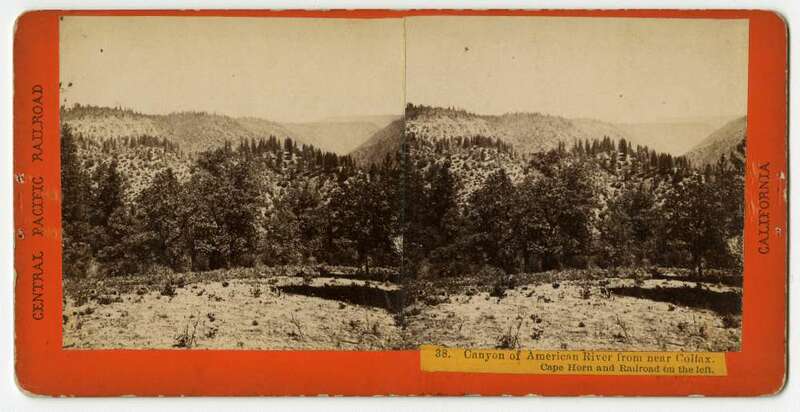 A stereo card, plate number 38, taken by Alfred A. Hart, in the canyon of the American River near Colfax, California. Photographed circa 1866, the tracks on Cape Horn can be seen on the left. Part of the Scenes in the Sierra Nevada Mountains stereo card album. A stereo card, plate number 41, taken by Alfred A. Hart in California. Photographed circa 1866, the 1,050 feet Long Ravine Bridge stands near Colfax. There is a train stopped on the trestle, and there are men standing on a flatcar. Part of the Sierra Nevada Mountains stereograph album collection. 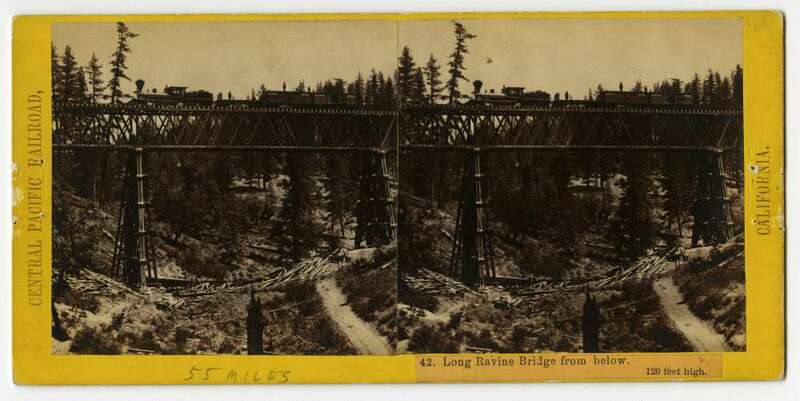 A stereo card, plate number 42, taken by Alfred A. Hart in California, of a train on the Long Ravine Bridge near Colfax. Photographed circa 1866, there is a train stopped on the trestle, and there are men standing on flatcars and boxcars. Located 56 miles from Sacramento, the trestle is 120 feet high. Part of the Sierra Nevada Mountains stereograph album collection. A stereo card, plate number 43, taken by Alfred A. Hart in Colfax, California. Photographed circa 1866, small buildings are near the railroad tracks at Cape Horn. 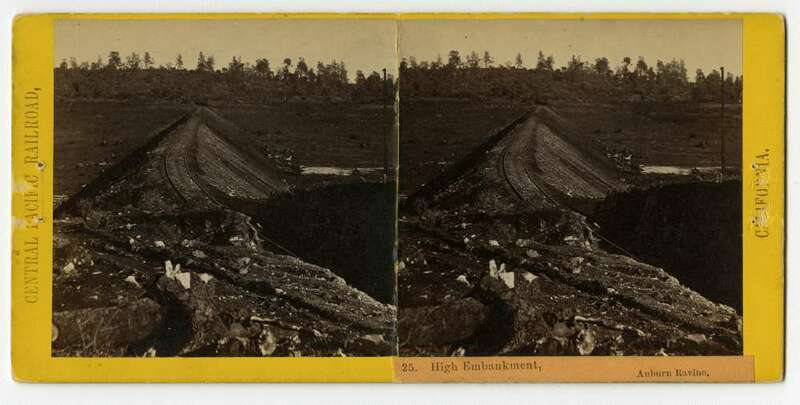 Part of the Scenes in the Sierra Nevada Mountains stereograph album collection. A.J. Russell's 19th century photographic images, contained in stereo card format, showing the Central Pacific's Colfax Station in California, 1869. Plate 564. A.J. 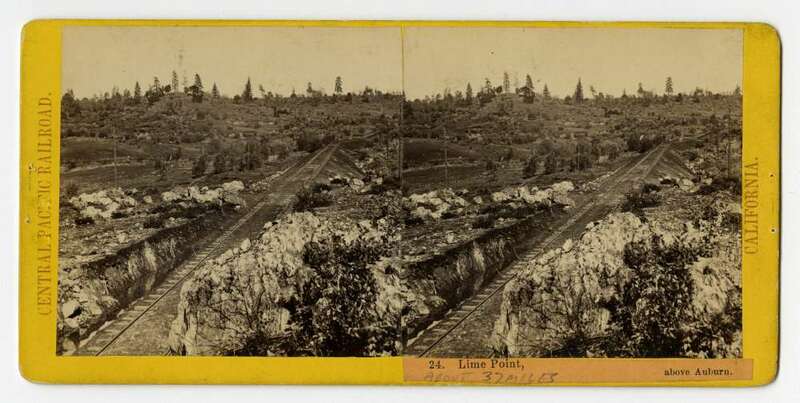 Russell's 19th century photographic images, contained in stereo card format, showing Colfax Station in California, 1869. Plate 559. As the iron rails were winding their way up the steep slope of the Sierra NevadaMountains, large temporary camps were set up to house and feed construction workers, including a large number of Chinese laborers. It was noted at the time that the Chinese workers did not get sick as often as the other laborers. One reason may have been because they boiled their water for tea, and thus, had little or no cases of dysentery. Their diet also may have contributed to their low sickness rate. Truckee's existence began in 1863 as Gray's Station, named for Joseph Gray's roadhouse on the trans-Sierra wagon road. A blacksmith named Samuel S. Coburn was there almost from the beginning, and by 1866 the area was known as Coburn’s Station. The Central Pacific Railroad selected Truckee as the name of its railroad station by August 1867, even though the tracks would not reach the station until a year later. A stereo card, plate number 224, taken by Alfred A. Hart in California circa October 1867. Two boys sit on a bridge across the Truckee River. In front of them is a trestle, which was the first of four crossings of the Truckee River. Part of the "Scenes in the Sierra Nevada Mountains" stereo card album collection. A stereo card, plate number 225, taken by Alfred A. Hart in California circa October 1867. The trestle over the first crossing of the Truckee River spans 204 feet. Part of the "Scenes in the Sierra Nevada Mountains" stereo card album collection. A stereo card, plate number 226, taken by Alfred A. Hart in California circa October 1867. An image of the interior of the first crossing of the Truckee River, which is located 133 miles from Sacramento. Part of the "Scenes in the Sierra Nevada Mountains" stereo card album collection. A stereo card, plate number 227, taken by Alfred A. Hart in California circa October 1867. Close to the first crossing of the Truckee River, tracks run along Profile Rock. Part of the "Scenes in the Sierra Nevada Mountains" stereo card album collection. 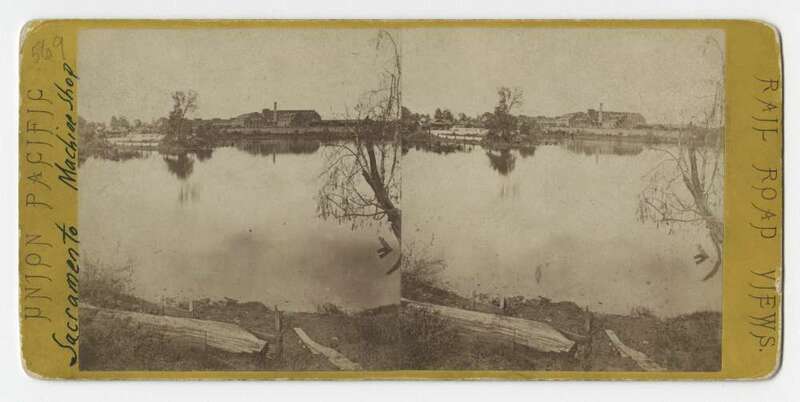 A stereo card, plate number 228, taken by Alfred A. Hart in California circa October 1867. Tracks running parallel to the Truckee River lead to Tunnel No. 14. This area, located 134 miles from Sacramento, is where the river enters the Eastern Summits. Part of the "Scenes in the Sierra Nevada Mountains" stereo card album collection. A stereo card, plate number 262, taken by Alfred A. Hart in California circa May of 1868. Locomotives and boxcars sit at the depot at Truckee, located 119 miles from Sacramento. Part of the "Scenes in the Sierra Nevada Mountains" stereo card album collection. A stereo card, plate number 263, taken by Alfred A. Hart in Nevada County, California, circa May of 1868. Supplies are stacked in the community of Truckee. Part of the "Scenes in the Sierra Nevada Mountains" stereo card album collection. A stereo card, plate number 267, taken by Alfred A. Hart in California circa May 1868. A view of the tracks along the Truckee River close to the California-Nevada state line. Part of the "Scenes in the Sierra Nevada Mountains" stereo card album collection. The town purportedly was named after a Paiute chief who yelled "Tro-kay," meaning "everything is alright," when encountering a party of immigrants. Among them was the Donner Party, who assumed the chief was yelling his own name, and the town became known as Truckee. Its name was officially changed from Coburn’s Station to Truckee April 9, 1868. Having weathered two years over Donner Summit, Central Pacific was relieved to finally reach the Truckee staging area in spring 1868. 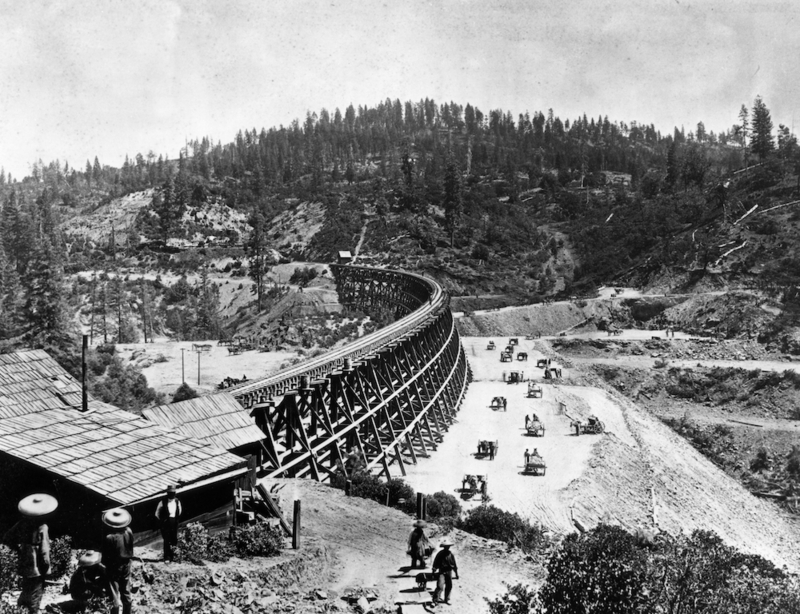 Truckee became a major supply stop for both crews and materials needed to extend the railroad into the Nevada desert. For a time after 1868, Truckee boasted the Pacific coast’s second-largest Chinatown due to the many Chinese workers employed by Central Pacific. Truckee continued growing and prospering along the Central Pacific line, supporting transportation for a burgeoning logging industry. Later in the 20th century, Truckee became known not only as an entrance to prime logging territory, but as a site for winter recreation and a great Hollywood filming location thanks to its picturesque mountains. The railroad’s arrival and Western settlement expansion caused great changes in the Native American communities calling this region home for thousands of years. These communities endured great upheaval, surviving in spite of harsh conditions and a changing cultural landscape. This is their story, as told by Tribal members. When you see something that you have never seen before, do you become curious or fearful? How much do you trust your judgment that your decision to approach is safe? Hiding in the shadows so as not to be noticed, who were these strangers? We can only speculate based on our own experiences and some of the stories told by our elders. Tribal Elder Helen (Pubigee) Timbimboo recalls that she was told as a young girl to run and hide, they are going to take you or kill you. This and other stories of assault by incoming workers and settlers posed a great threat to the women of the Tribe and have been passed down through the generations. The coming of the first non-Indian people in 1824 would be the first of many disruptions to the Life Ways of the Newe people of the Great Basin. They would experience the coming of the Over Landers between 1830 and 1860; the pioneers in 1847; the Battle Creek battle of Jan. 29, 1863, which became the Battle at Bear River, and in 1990 was changed to the Bear River Massacre; and the completion of the first transcontinental railroad on May 10, 1869. Many settlers viewed the Plains Indians as obstacles to be removed. General William Tecumseh Sherman wrote in 1867: "The more we can kill this year, the less we will have to kill next year, for the more I see of these Indians the more convinced I am that they all have to be killed or be maintained as a species of paupers." Through the 1860s, we continued to follow the food gathering traditions, but this changed due to the loss of land to non-Indians moving into the area. The completion of the railroad made matters worse. A large number of emigrants could now easily reach Utah and compete with the Shoshone and other Indian groups for land and resources. It spawned the birth of Corinne in the heartland of the Shoshone domain, a development that from its beginning proved to be problematic to the Indians. After 35 years, it was reported in the Deseret Evening News on May 26, 1898, by a correspondent writing about the Community of Washakie: "Here is a town laid out with school houses and church, homes, farms and every convenience found in settlements no older than Washakie. Many neat homes are found here. Grains of all kinds and lucern are abundant. The farms, lots and corrals are fenced; every kind of modern farm machinery is in use, and from all wandering, useless being, the noble Red Man has become an independent farmer, and some of them are getting rich." The report could have very well been true as the newspaper saw the facts. In reality, the Washakie Indians were "wards" of the Church of Jesus Christ of Latter-Day Saints, or "Mormons." The Washakie Indians had to adapt to the ways of the white man or perish. They learned to farm and ranch the land, they helped build the Logan Temple and the Samaria Canal. They had a saw mill and made their own bricks. They raised horses, sheep, chickens, pigs and cows. And, they had allotments of land from the U.S. government — which some Indian families accepted and others declined. Those who declined the land were given a promise that they would be taken care of by the "Church." The railroad enabled the Washakie Indians to go farther and see sights that would have taken them days or months to see. The railroad was the end, and the beginning, of a culture of people who had no control of their destiny except to conform and live. 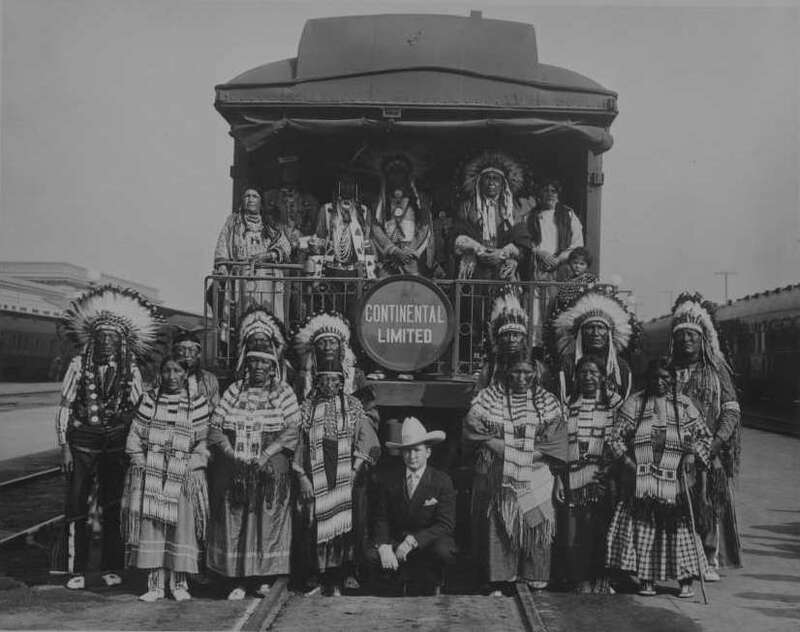 Arapahoe and Shoshone Native Americans stand on rear platform of Continental Limited with Tim McCoy on April 17, 1925. This image was published in the 1925 issue of Union Pacific Magazine. A.J. 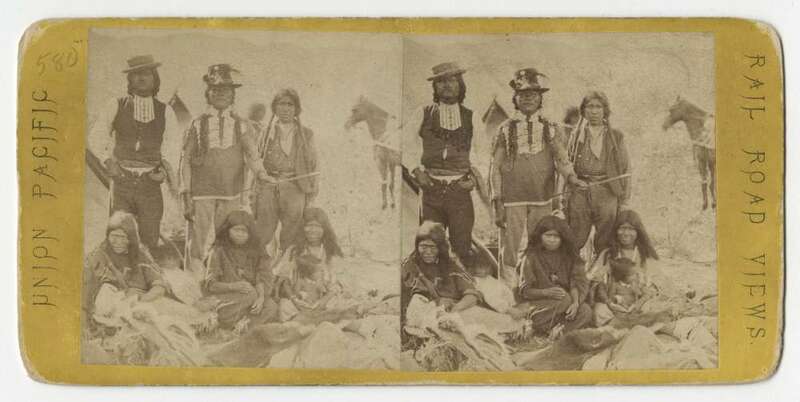 Russell's 19th century photographic images, contained in stereo card format, showing Shoshone Indians, 1869. Plate 580. A.J. Russell's 19th century photographic images, contained in stereo card format, showing Shoshone Chiefs, 1869. Plate 579. A stereo card, plate number 323, taken by Alfred A. Hart in Nevada circa November 1868. Members of the Shoshone Nation examine a locomotive in the Humboldt Desert. Part of the "Scenes on the Humboldt River" stereo card album collection. A stereo card, plate number 324, taken by Alfred A. Hart in Nevada circa October 1868. Members of the Shoshone Nation sit in the Humboldt Plains. 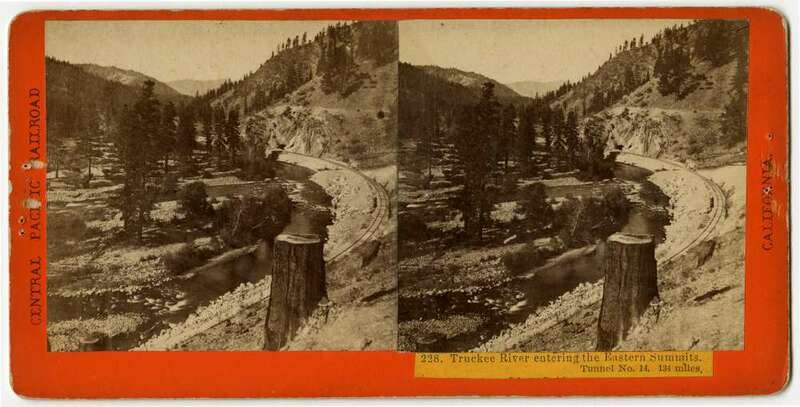 Part of the "Scenes on the Humboldt River" stereo card album collection. A stereo card, plate number 340, taken by Alfred A. Hart in Nevada circa November 1868. A man, possibly a member of the Shoshone Nation, stands on a bluff in the Palisades. He is looking at the river and railroad beneath him. This area is located 435 miles from Sacramento. 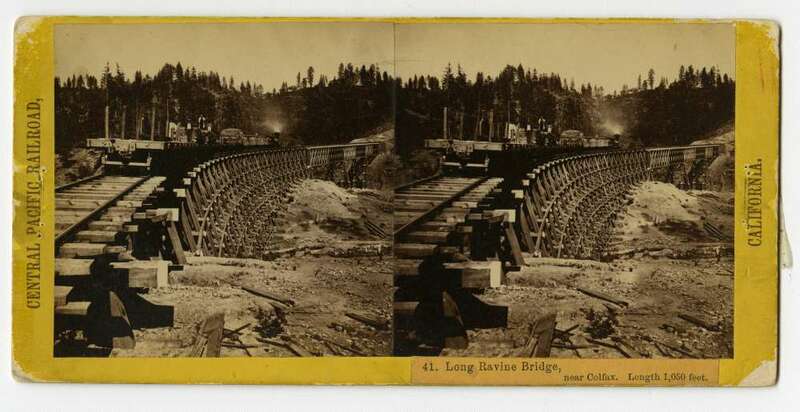 Part of the "Scenes on the Humboldt River" stereo card album collection. A stereo card, plate number 342, taken by Alfred A. Hart in Nevada circa November 1868. A group of American Indians from the Shoshone Nation gather near the river on the Humboldt Plains. Part of the "Scenes on the Humboldt River" stereo card album collection. A stereo card, plate number 342A, taken by Alfred A. Hart in Nevada circa November 1868. A group of American Indians from the Shoshone Nation gather near the river at Ten Mile Canyon. Part of the "Scenes on the Humboldt River" stereo card album collection. The area that would become Reno, Nevada, started out in 1859 as Fuller's Crossing, named after Charles William Fuller, a settler who claimed a small piece of land on the south bank of the Truckee River. From there he built a bridge over the river and a small hotel. In 1861, Fuller sold the bridge and his hotel to Myron Lake, who quickly renamed the area Lake's Crossing. Photograph of steam locomotives No. 2655 and No. 2723 at Reno, Nevada, taken in 1907. A stereo card, plate number 284, taken by Alfred A. Hart in Reno, Nevada, circa August 1868. Wagons, filled with supplies, are assembled at the freight depot in Reno, located 154 miles from Sacramento. Part of the "Scenes in the Sierra Nevada Mountains" stereo card album collection. A stereo card, plate number 285, taken by Alfred A. Hart in Reno, Nevada, circa August 1868. Men gather at the Reno depot. Part of the "Scenes in the Sierra Nevada Mountains" stereo card album collection. A stereo card, plate number 286, taken by Alfred A. Hart in Reno, Nevada, circa August 1868. A view of Virginia Street, as seen from the bridge. Men are walking outside of the shops, and horses pull carts and carriages. Part of the "Scenes in the Sierra Nevada Mountains" stereo card album collection. Photograph of the Observation Platform of the Pacific Limited while at Reno, Nevada, 1940. Photograph of the Pacific Limited at Reno, Nevada, taken in the late 1940s. Lake's Crossing became an important point between northern California and the nearby Comstock Lode — the first major silver discovery in the United States. At the time, Lake was the sole landowner, but that would soon change. In 1868, the Central Pacific Railroad crossed the Sierra Nevada mountain range and began laying tracks in the region. Central Pacific construction engineer Joseph M. Graham drove the first stake in surveying the new town April 1, 1868. The first train to go from Sacramento, California — the transcontinental railroad's western starting point — to Reno arrived June 18, 1868. An agreement was reached between Lake and the railroad that a new town would be created at the crossing. A new name seemed only fitting, and so Lake's Crossing officially became known as Reno — after Gen. Jesse Lee Reno, a Union army officer killed during the Civil War. The town soon became an important commercial center on the transcontinental railroad and a transfer point for the immense wealth coming out of the Comstock Lode. 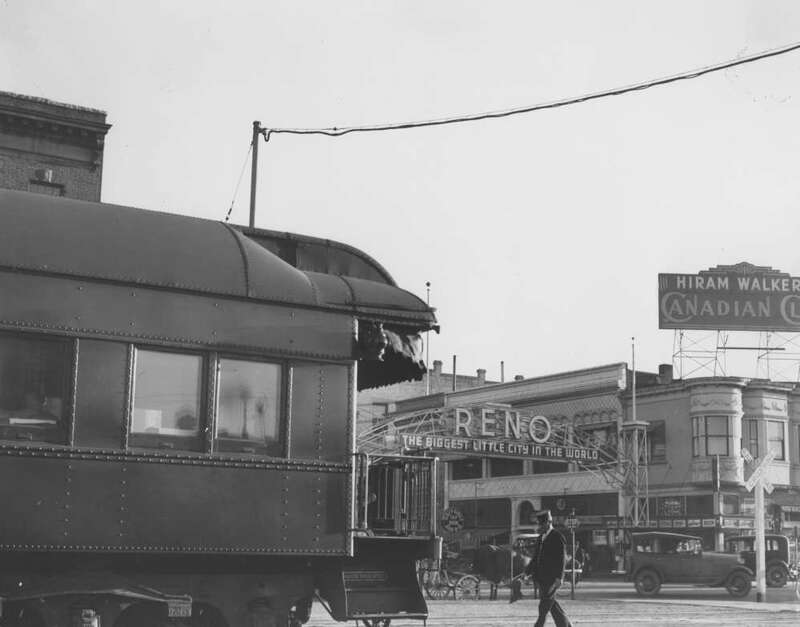 Agriculture — particularly cattle and alfalfa hay — made constant demands on Reno's rail services, creating an immediate economic mainstay for the town. Despite the boom-and-bust cycle of mining, Reno leveraged its role as a transportation hub and grew into the state's largest town. As a result, Reno was a financial and industrial hub as the 20th century dawned. The town was a bustling small metropolis with fashionable Victorian homes and commercial and municipal buildings. Few towns can claim to have been custom-designed by a railroad as Sparks was. When Southern Pacific Railroad succeeded Central Pacific as the new owner of the main line across northern Nevada, it decided to realign the tracks. The new route bypassed the town of Wadsworth, which for 40 years had controlled the roundhouse and maintenance facilities of Central Pacific. 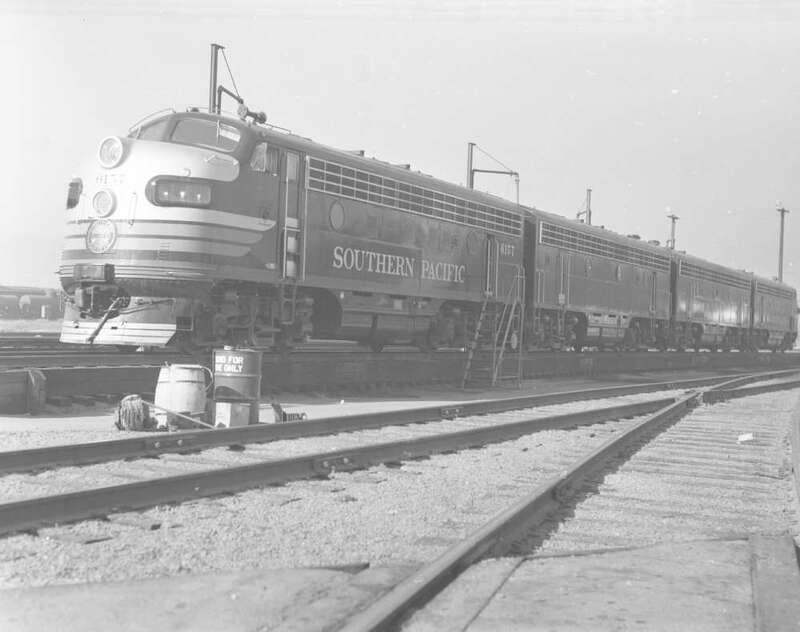 Photograph of locomotive SP 6157 and trailing units at Sparks, Nevada, 1949. 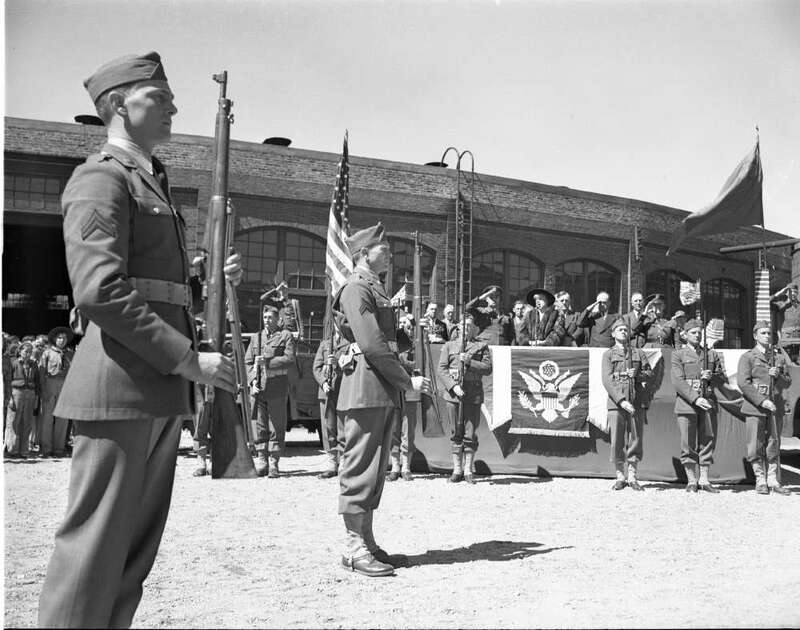 Photograph of a flag raising ceremony in Sparks, Nevada, to support war bonds, 1945. Photograph of the shop in Sparks, Nevada, February 1944. Since the new alignment was too far from Wadsworth, Southern Pacific made a rather startling offer to its employees. 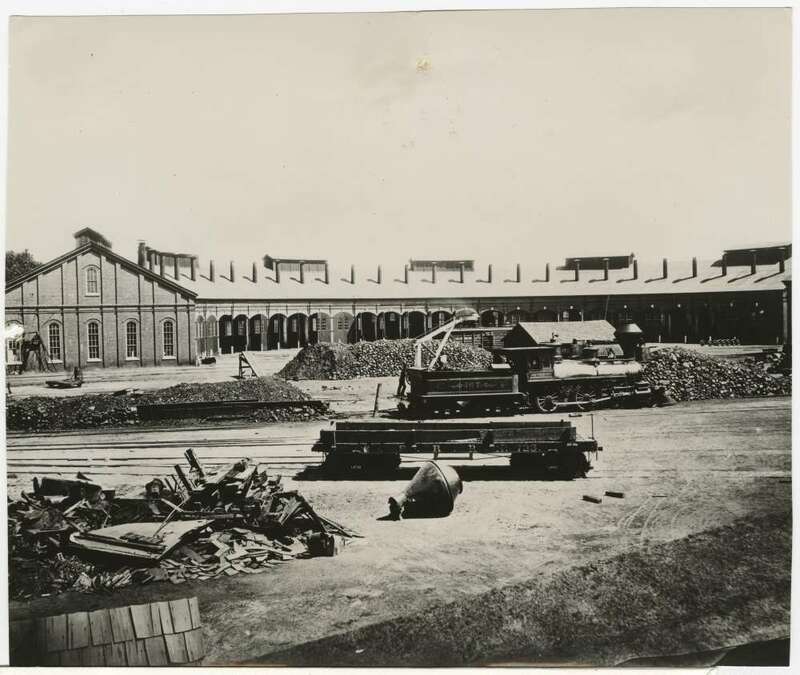 In 1902, it purchased a large tract of swamp-like land near its newly built railyard and using 334 railcars and scores of workers, spread dirt and gravel to build up the land. Two years later, the railroad gave everyone clear deed to a 50' x 140' lot for the grand sum of $1. To make the deal more enticing, it offered to pick up and move — free of charge — every house in Wadsworth and reassemble it in this new town. The town originally had a number of names, including East Reno, Glendale and Harriman, after E.H. Harriman, then president of Southern Pacific. Residents finally named the new city Sparks in honor of then sitting Nevada Governor John Sparks. The entire city, schools and parks grew up around the rail yard. In fact, the high school’s sports teams are still known as the Sparks Railroaders, and its logo features a steam train. Sparks is still known as Rail City, and the rail yard continues its vital role in the entire valley's economy. A few years ago, along with expanding the tunnel size over Donner Pass to accommodate double-stack cars, Union Pacific constructed a third line in the yard to help accommodate traffic coming from the west. Sparks is a locomotive and crew change point. Near the turn of the 20th century, the section of the original Central Pacific Railroad that ran across the 40-mile desert was abandoned in favor of a new line to the south of the Hot Springs Mountains. While the route was longer, it eliminated the need for helper locomotives over White Plains Hill, and therefore made for a faster, more efficient operation. 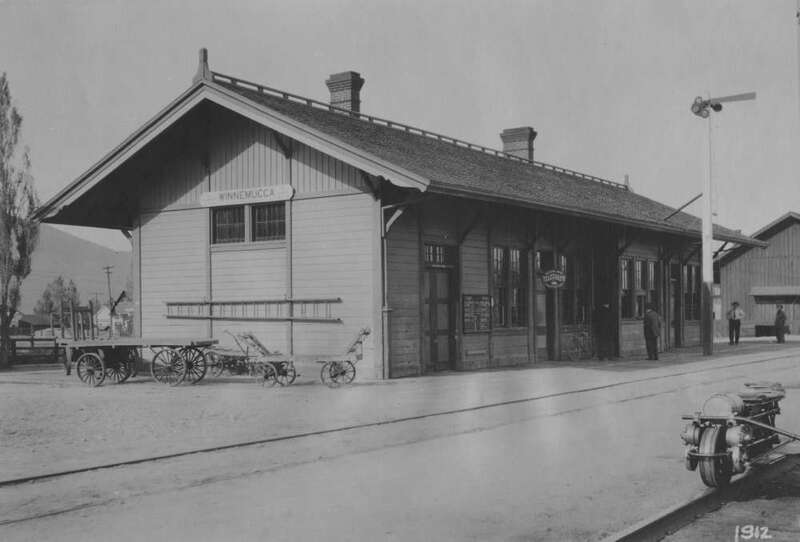 Photograph of a train station in Fernley, Nevada, 1914. This new route helped usher in the founding of Fernley. The town was established in 1904 as an agricultural and ranching community. As such, the federal Bureau of Reclamation's Newlands Project provided for the building of a 32-mile canal — the Truckee Canal — to carry water from the Truckee River through Fernley and ultimately into the Lahontan Reservoir. 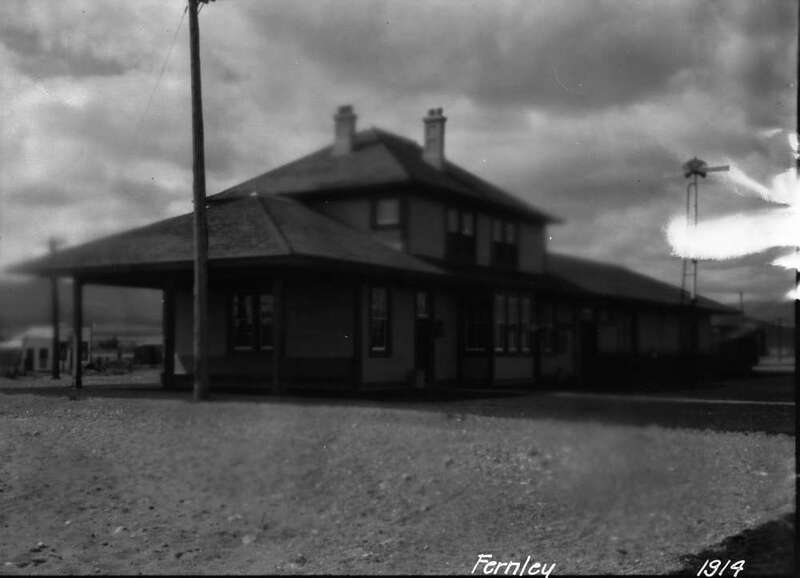 In 1908 Fernley's post office was open. Earlier, in 1885, Southern Pacific Railroad had leased the Central Pacific, and by 1912 Fernley had become the connection point for Southern Pacific’s Westwood branch, which was built as the Fernley & Lassen. In 1929 it was incorporated into the Modoc line, which connected Fernley with the Southern Pacific at Klamath Falls, Oregon. Fernley remained an important junction until the Modoc line trains were routed to Winnemucca, Nevada, via the Western Pacific Railroad in 1962. In December 1913, grading started for the new Fernley Depot, which was completed in August 1914. The depot was in use until the Southern Pacific Railroad closed it in September 1985. The depot was purchased by the Fernley Preservation Society in January 1986 and was moved to its present location on Main Street in September 1986. 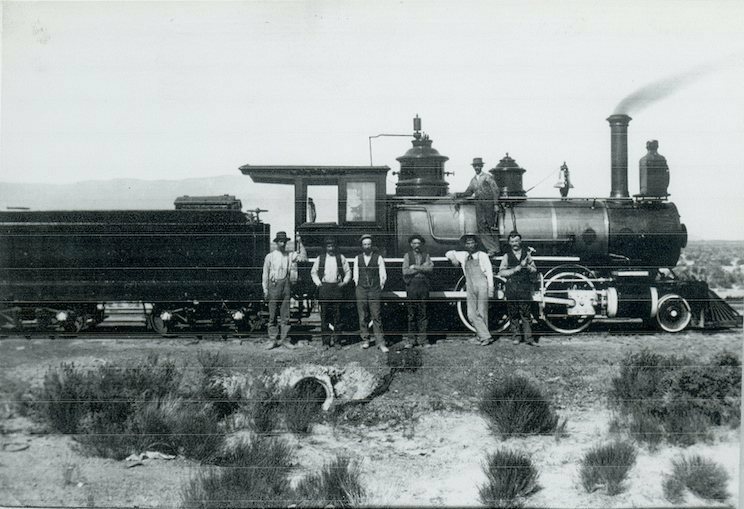 The arrival of the Central Pacific Railroad through Pershing County in 1868 changed the history of Lovelock. Earlier, in 1862, Englishman George Lovelock settled in the area, attracted by the fertile soil that made the area suitable for agriculture. He built a small stage station there, which eventually became a station on the Central Pacific Railroad. 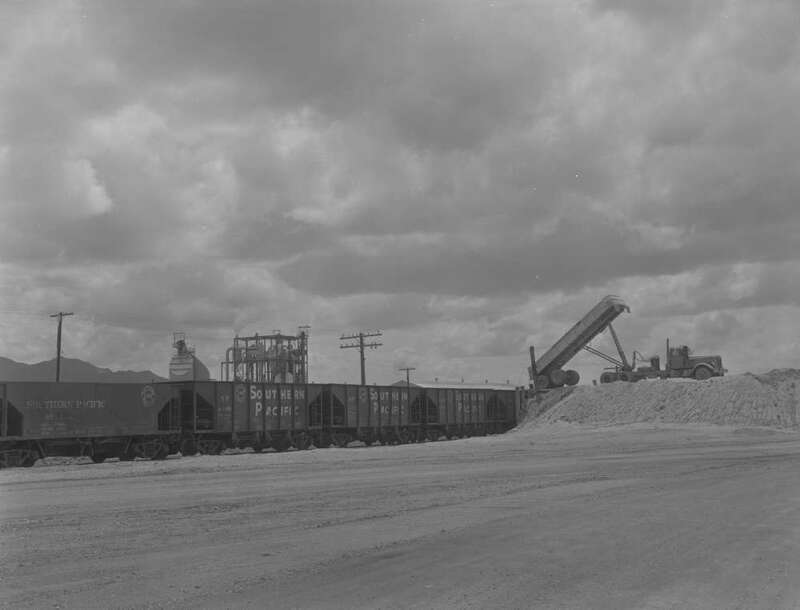 Eagle Picher diatomaceous earth plant in the background of iron ore loading in Lovelock, Nevada, with Southern Pacific train cars that can be seen in the background, May 17, 1962. A panoramic view of the city of Lovelock, Nevada, 1890. Lovelock is situated in a valley with the Humboldt Range to the east and the Trinity and Seven Troughs ranges to the north and west. In the 1860s, this valley was known to settlers as Big Meadows because of its abundant grass and water. It also was a favorite resting spot for folks traveling to California and Oregon. To this day, Lovelock remains one of Nevada's most prosperous agricultural districts. 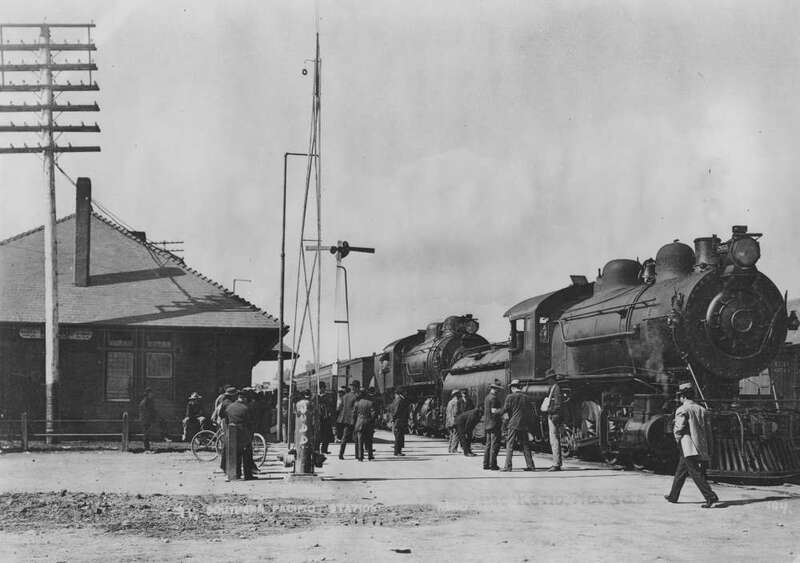 The railroad helped transform Lovelock into a mining, agriculture and retail center. Like many railroad towns, Lovelock had a thriving Chinese population. These settlers developed the area into a large mining community. In fact, nearby Coeur Rochester was once the world's seventh largest silver producer. Along with its various industries, Lovelock's infrastructure grew. In 1875, a post office was established and by the turn of the 20th century, the town's population was 1,204, with a school, two churches and an active business district. It's fair to say that the Central Pacific Railroad was responsible for bringing the country to Winnemucca, and Winnemucca to the rest of the country. The railroad reached the region Sept. 16, 1868, and was officially opened to Winnemucca three weeks later. A stereo card, plate number 319, taken by Alfred A. Hart in Nevada circa November 1868. Three locomotives sit on the tracks at the Winnemucca Depot. Supplies are stacked next to the tracks, including large water tanks. Part of the "Scenes on the Humboldt River" stereo card album collection. A stereo card, plate number 320, taken by Alfred A. Hart in Nevada circa November 1868. The town of Winnemucca is located 334 miles from Sacramento. Winnemucca Peak can be sen in the distance. Part of the "Scenes on the Humboldt River" stereo card album collection. Photograph of a train station in Winnemucca, Nevada, taken in 1912. Oddly, there was no celebration at the time of the rail's arrival, perhaps because so much more work was ahead as the railroad continued laying tracks on its eastward mission. By November, the railroad was completed through Humboldt County (when, in 1872, Winnemucca would be designated the county seat.) The actual naming of the town came earlier, named after a chief of the Piute tribe. Once the railroad arrived, Winnemucca began to flourish. Charles Crocker, one of the original backers of the Central Pacific, thought it was a good place for the railway to intersect the stage lines that ran both north and south. By 1870, Winnemucca was a modern town, with nearly 300 citizens. It eventually had two hotels, five stores, two stables, two blacksmith shops and a brewery. The town's location — right on the Humboldt River — is nine miles west of the Big Bend, and about 61 miles below the mouth of Reese River. Winnemucca became a depot for trade with neighboring Idaho, and a stage for the mining region that ran through the city. The railroad and mining played an important role in the early days of Battle Mountain. When the Central Pacific Railroad came through the area in October 1868, it encountered a loosely knit community of mining camps inspired by the boomtown of Austin, located 90 miles south. 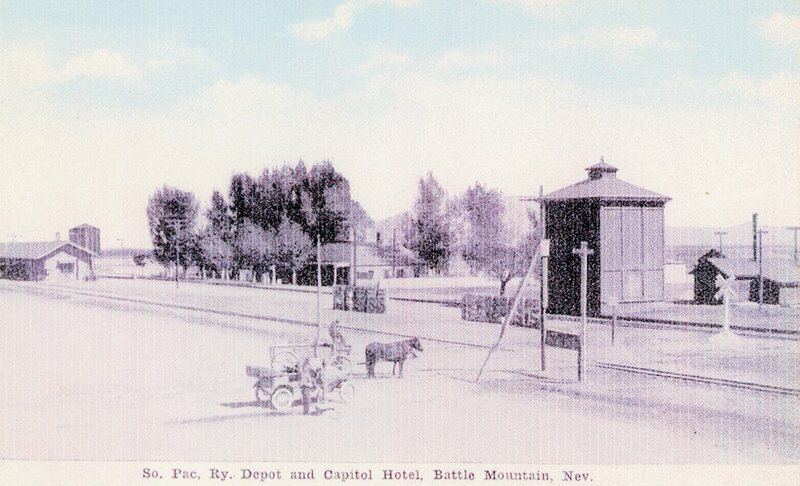 An 1870s image of the Southern Pacific Railroad Depot and Capitol Hotel, Battle Mountain, Nevada. Photo courtesy of The Battle Mountain Cookhouse Museum. 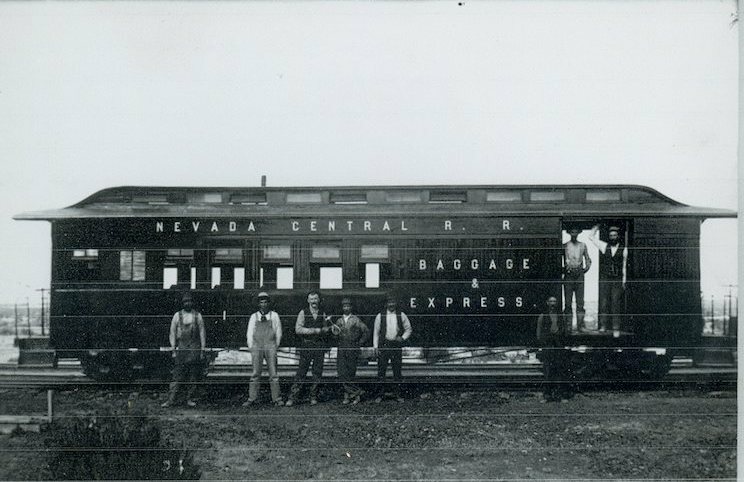 A Nevada Central Railroad train crew. Photo courtesy of The Battle Mountain Cookhouse Museum. 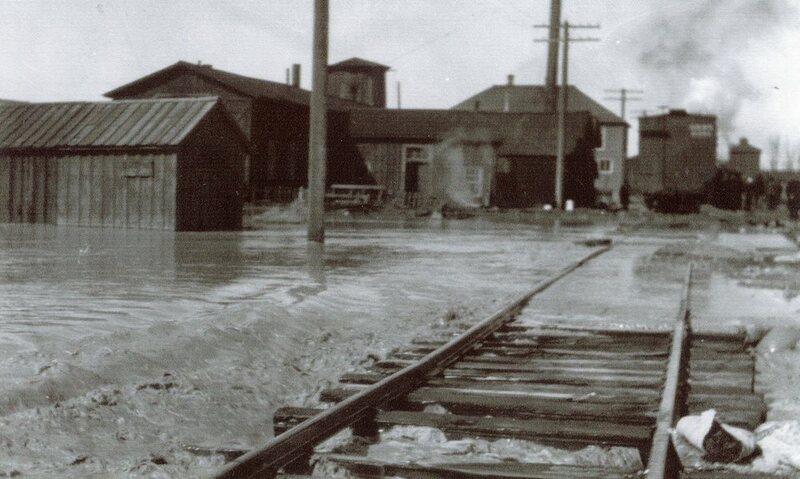 Nevada Central Railroad shop yard during the 1910 flood. Photo courtesy of The Battle Mountain Cookhouse Museum. The town of Battle Mountain is named for a mountain to the southwest, where in the early 1860s Native Americans attacked a band of gold seekers. When Central Pacific established its station there, the railroad named the area Reese River Siding. The actual town of Battle Mountain was a few miles west in the Battle Mountain Range. However, with the railroad's arrival the town moved to Reese River Siding, bringing its name with it. Battle Mountain became a significant shipping point for cattle ranches in the adjacent Pumpernickel and Reese River valleys. Its post office was established in 1870. By 1880, Battle Mountain had a population of 522 and was an important meeting point for the Nevada Central Railroad, which connected Austin with the Central Pacific. That line was shut down in 1938. Through most of the 20th century, Battle Mountain's economy was based on shipping, mining and livestock. Today, the city has a population of just over 3,600 residents. 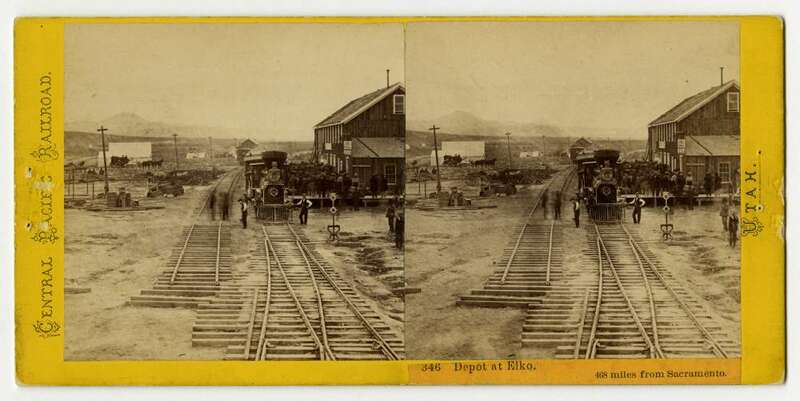 Elko was established in 1868 in anticipation of the Central Pacific Railroad's arrival. The rails came through on Christmas Eve that year and served as the east end terminus. The railroad's arrival also provided Elko a year-round connection with the outside world. Charles Crocker, one of the original financiers of the Central Pacific, likely named the town. 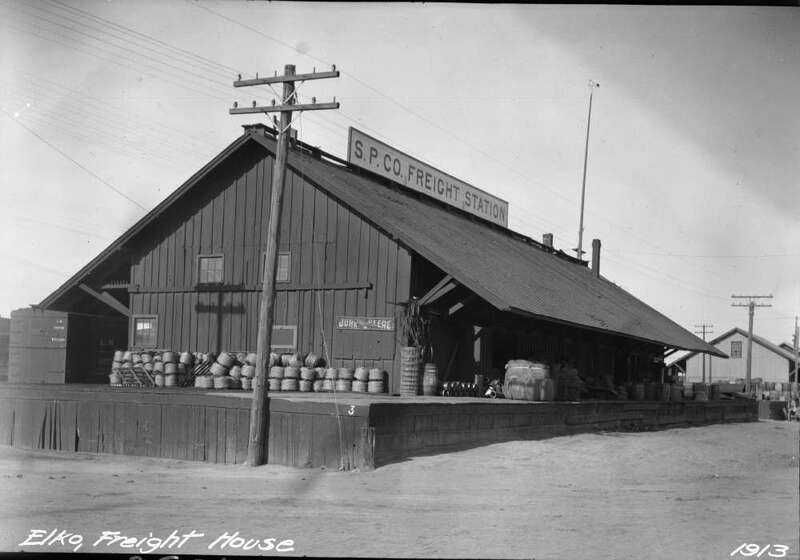 Photograph of Southern Pacific freight station in Elko, Nevada, 1913. A stereo card, plate number 347, taken by Alfred A. Hart in Nevada circa February 1869. A cart rests next to a tent in the town of Elko, located 468 miles from Sacramento. Part of the "Scenes near Great Salt Lake" stereo card album collection. A stereo card, plate number 346, taken by Alfred A. Hart in Nevada circa February 1869. A group of people stand on the platform at the depot in Elko, Nevada. The depot is located 468 miles from Sacramento. Part of the "Scenes in the Sierra Nevada Mountains" stereo card album collection. Six months after the railroad arrived, development flourished. Elko had two banks, 45 saloons, three hardware stores, eight doctors, eight attorneys and scores of other businesses. In 1875, the Elko Water and Flour Milling Company opened and would soon be responsible for modernizing the town in two important ways. First, the company brought water to Elko's municipal water system via a canal built from the Humboldt River about nine miles away. Second, in the 1890s, the mill generated the town's first electricity using a power-producing system associated with the milling process. Elko became a critical distribution point for the Central Pacific in northeastern Nevada, and was quickly established as the central business hub for the otherwise desolate Elko County. A sizeable population of Chinese immigrants who worked on the railroad returned to Elko after they finished laying the tracks in 1869. In October 1983, Union Pacific opened new railroad tracks in Elko as a result of "Project Lifesaver" — an effort that relocated two main line railroad tracks from the heart of downtown. In addition to improving safety, "Project Lifesaver" also transformed the community's transportation network, positioning the city for future growth. Of all the events that helped shape our nation in the 19th century, few surpassed the importance of what took place on May 10, 1869. On that day, the dream of a transcontinental railroad became a reality when the railheads of the Union Pacific and Central Pacific railroads finally met at Promontory Summit, Utah. 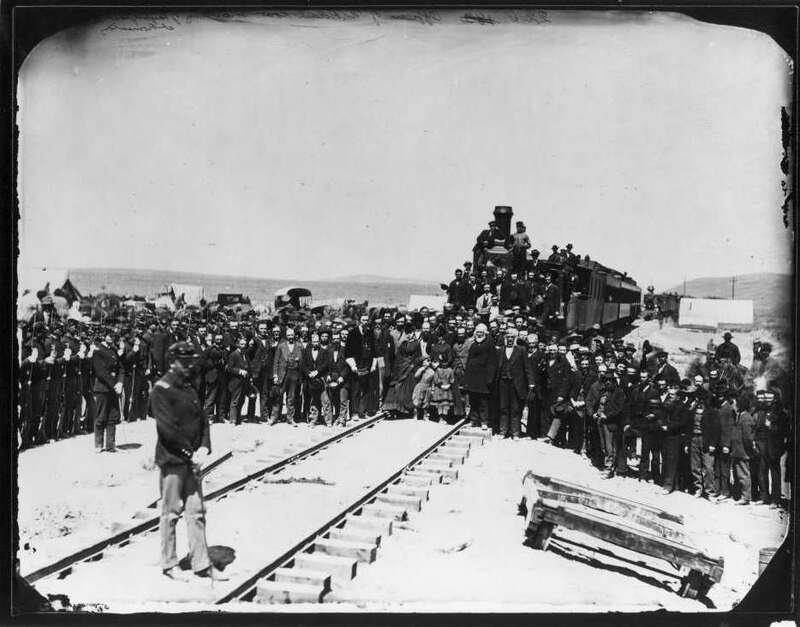 The event — marked by the driving of a golden spike to complete the line — brought to a finish a grueling 7-year journey that began when President Abraham Lincoln signed into law the Pacific Railroad Act on July 1, 1862. The path to the Summit was hard-fought, perilous and competitive. In late April 1869, the Central Pacific, with teams of Irish and Chinese workers, set a record for laying 10 miles and 56 feet of track in 12 hours at Rozel, Utah. This accomplishment began as a bet with the Union Pacific, whose men had once laid seven miles of track in one stretch (although they had reportedly worked from 4 a.m. to midnight to complete the task, well beyond a regular day's work). At the time, the San Francisco Bulletin called the feat "the greatest work in track laying ever accomplished or conceived by railroad men." A top-ranking Army commander, who was watching the workers' progress with his soldiers, commented that he had never seen such organization, and that "it was just like an army marching over the ground and leaving the track built behind them." But on May 10, the rails did meet and a country was united coast to coast. 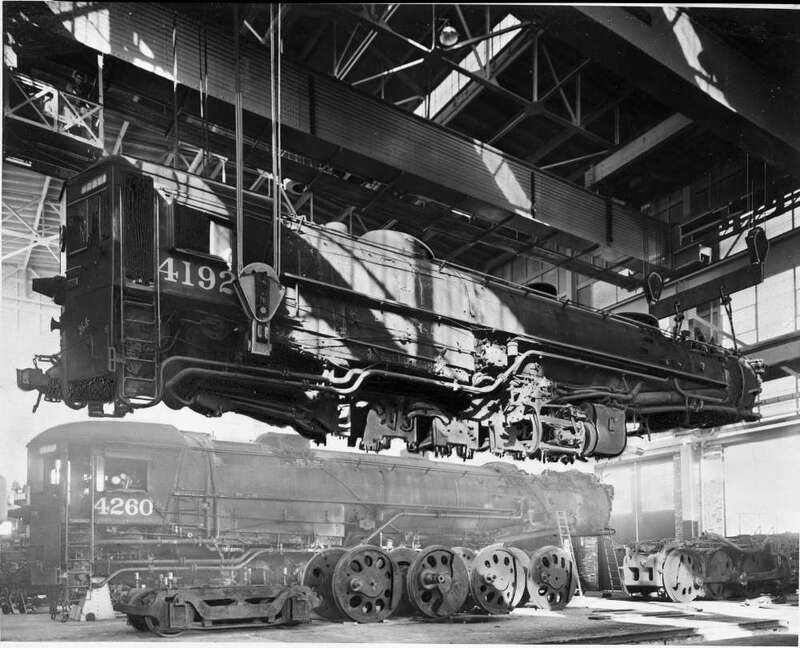 Scores of dignitaries, railroad executives, and journalists witnessed the momentous event. The Daily Alta California, a 19th-century San Francisco newspaper, wrote the following day: "In the face of natural obstacles of the most forbidding character, the shores of the Atlantic and the Pacific are at last practically united by an iron highway spanning the continent...From henceforth we are in the Union and of it, and the great event of the age has brought us all home at last." 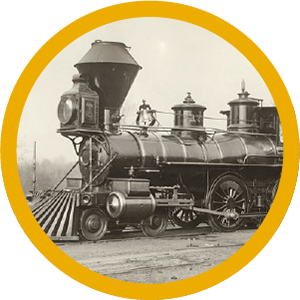 Today, Promontory Summit is the home of the Golden Spike National Historic Monument. In 1870, this original junction point for Central Pacific and Union Pacific railroads was moved to nearby Ogden. Promontory became primarily a helper station, housing mostly railroad workers and their families. 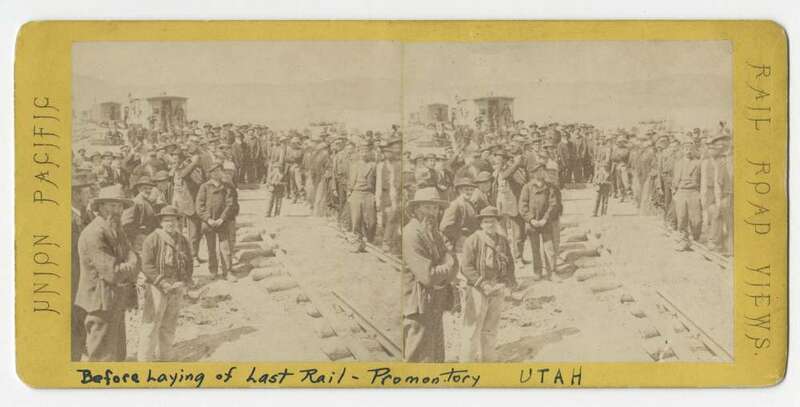 Plate 227, "East and West shaking hands at laying of the last rail," Promontory Summit, Utah. Photograph was taken by Andrew Russell on May 10, 1869. General Dodge, chief engineer for Union Pacific, is pictured shaking hands on the right, with Central Pacific engineer Montague on the left. 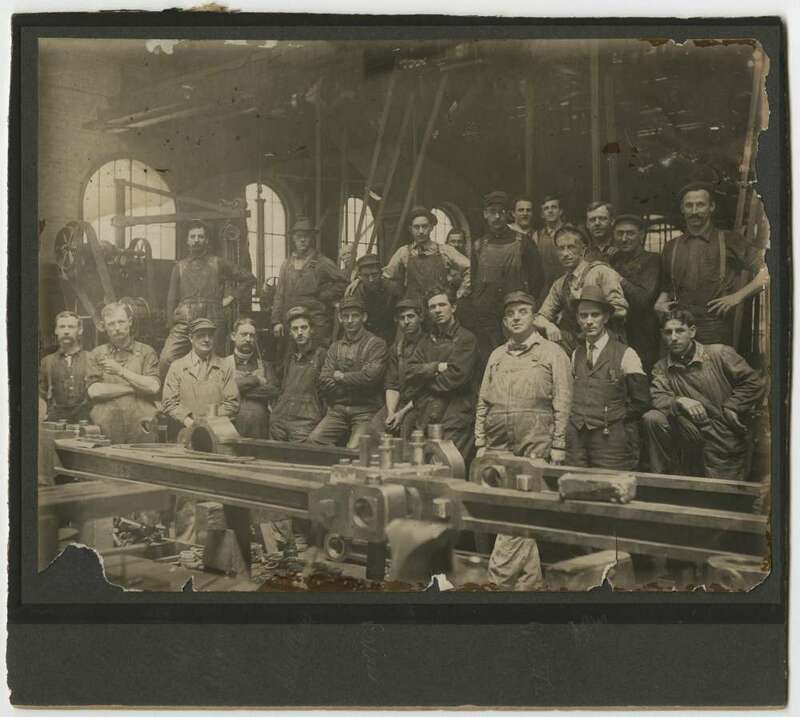 This print was created before the original glass plate was broken. The glass plate negative is in the collection of the Oakland Museum (California). Andrew J. Russell imperial print, "Promontory Trestle Work," plate 220. Officers and directors of Union Pacific at the laying of the last rail, Promontory Summit, Utah, May 10, 1969. Image taken by Andrew Russell. A.J. 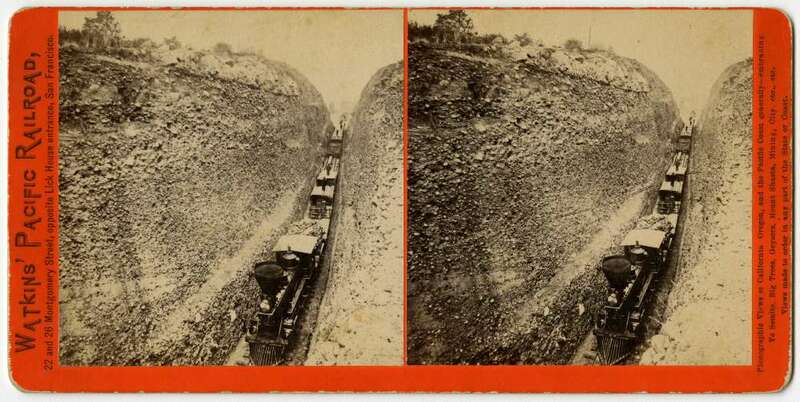 Russell's 19th century photographic images, contained in stereo card format, showing the scene before laying of the last rail in Promontory, Utah, 1869. Plate 541a. A.J. 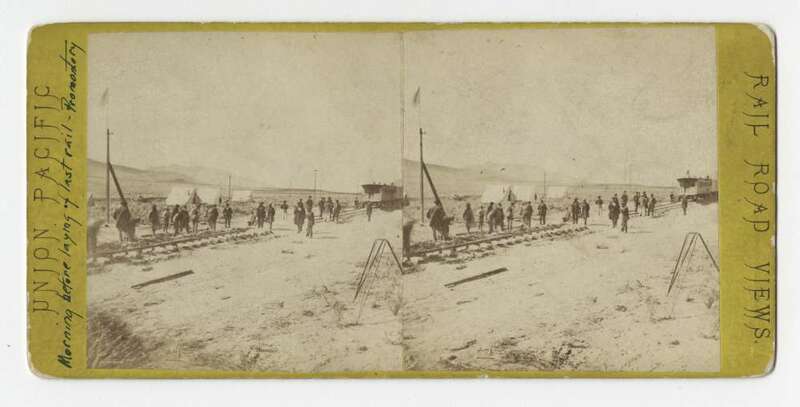 Russell's 19th century photographic images, contained in stereo card format, showing the morning before laying of the last rail in Promontory, Utah, 1869. Plate 541. A.J. 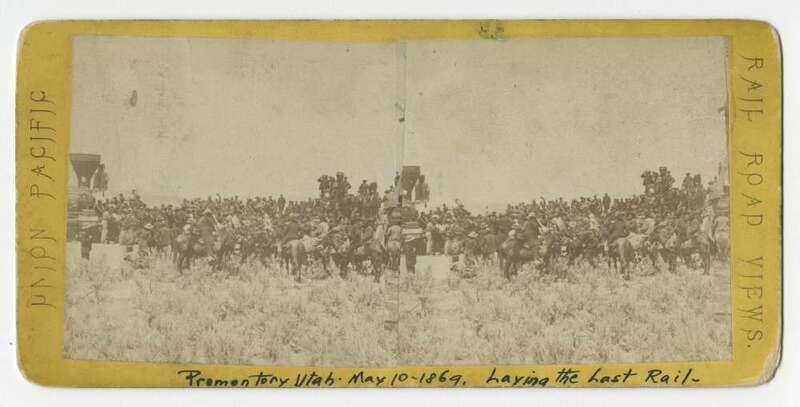 Russell's 19th century photographic images, contained in stereo card format, showing the laying of the last rail at Promontory, Utah on May 10th, 1869. Plate 540. A.J. 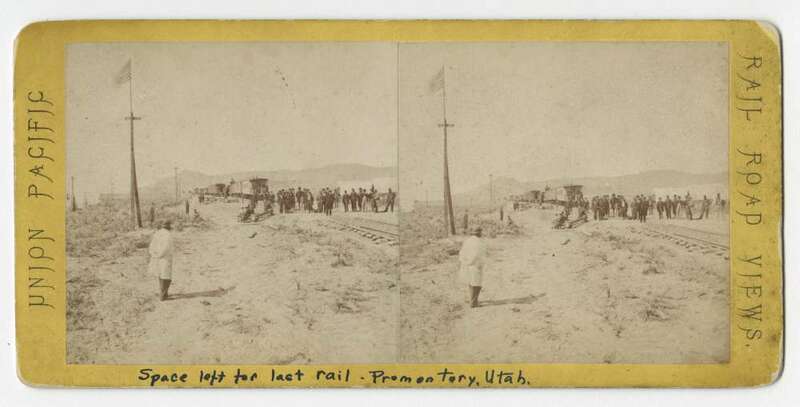 Russell's 19th century photographic images, contained in stereo card format, showing the space left for the last rail connecting the link between the Union Pacific and the Central Pacific railroads on the morning before the laying of the last rail in Promontory, Utah, 1869. Plate 538. A.J. 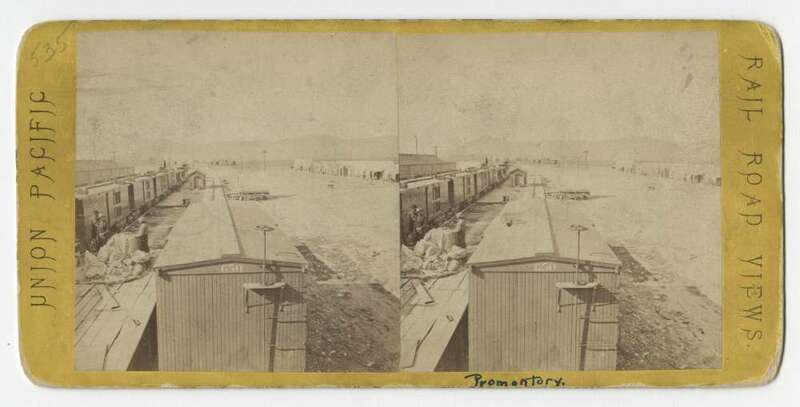 Russell's 19th century photographic images, contained in stereo card format, showing the view from the top of a freight car in Promontory, Utah, 1869. Plate 535. A.J. 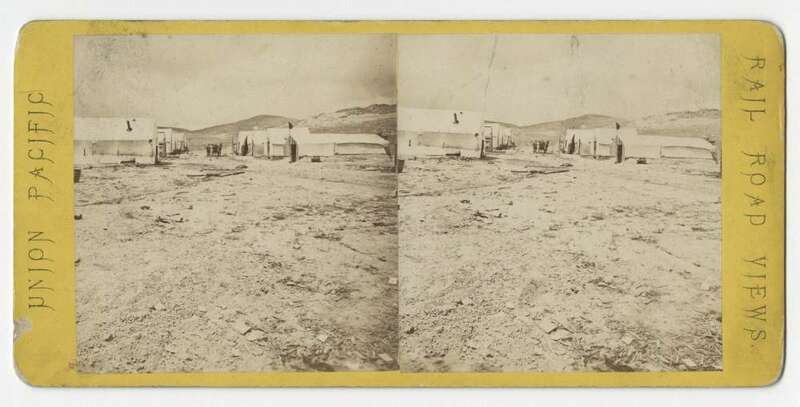 Russell's 19th century photographic images, contained in stereo card format, showing Deadfall, a "hell-on-wheels" town near Promontory, Utah, 1869. Plate 533.